Marasmia trapezalis - Hodges#5288 (Trapeze Moth). 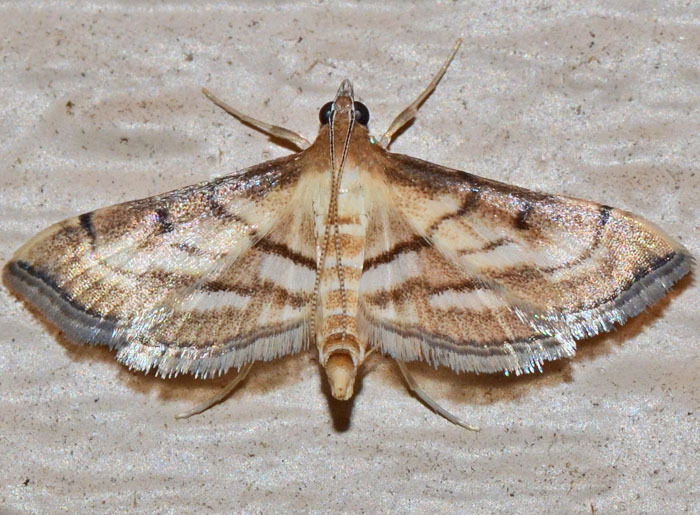 This Trapeze Moth is very similar to the Marasmia Moth (M. cochrusalis) but in the latter, the PM lines on the forewing and the hindwing line up on the spread wings. The Trapeze Moth is also called Rice Leaffolder because its larvae feed on leaves of corn, rice, and other grains and the second and later instars feed within the rolled leaf. The larvae are greenish-yellow with stiff brown bristles and wiggle when disturbed.